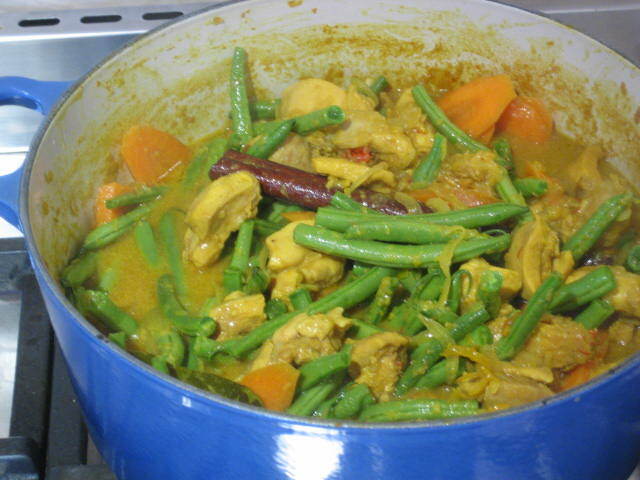 Malaysian Chicken curry – so so so delicious thanks Gordon!! Last Friday was a cook-a-thon. I agreed to cook a batch of freezer friendly meals for one of my friends. Coming up with some options was actually a bit of a challenge as I don’t usually freeze anything! So with a bit of online research and a good rummage through my cook books we decided on 5 different dishes. 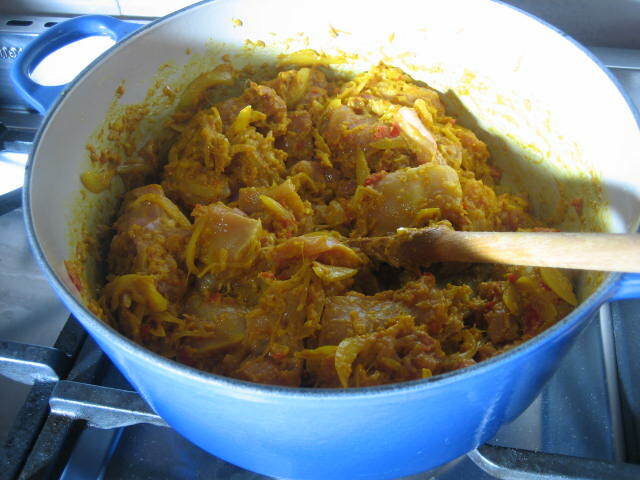 One of them being this Gordon Ramsay’s Malaysian Chicken curry which I found on the BBC website. Gordon you are a legend!! What a cracker. Very tasty and pretty easy to make too. I absolutely can not claim this as my own recipe but am planning on doing a version with Monkfish with a few additions to the curry paste e.g. Galangal so will keep you posted. Oh and by the way this is a great recipe for all you fresh coriander haters – as you will know most curry pastes include coriander root – this is a coriander free zone!!! Well kind of, it does suggest that you sprinkle fresh coriander on top when you serve but this can be omitted. 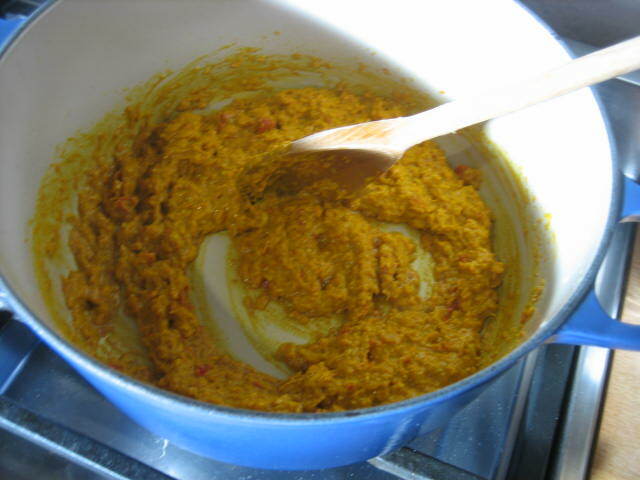 Kick off with making the curry paste. In an ideal world you would use a food processor for this or a blender but you could do it in a mortar and pestle. Peel any touch outer layers from the lemon grass then slice finely, peel and finely chop the ginger, peel and quarter the shallots, de-seed and finely slice the red chilies, peel and finely chop the garlic. 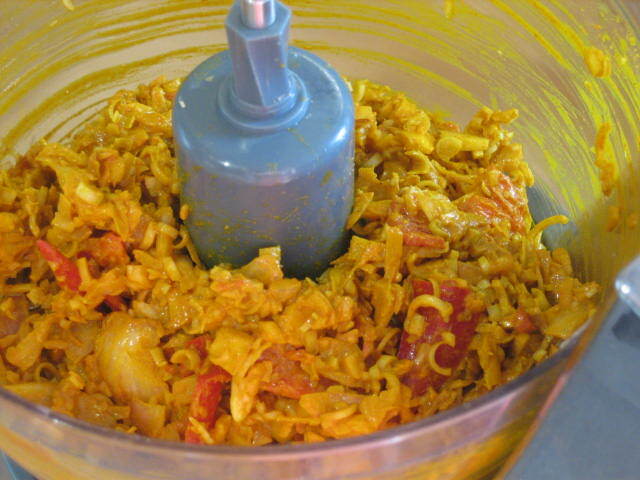 Pop all of this in the food processor with the turmeric. 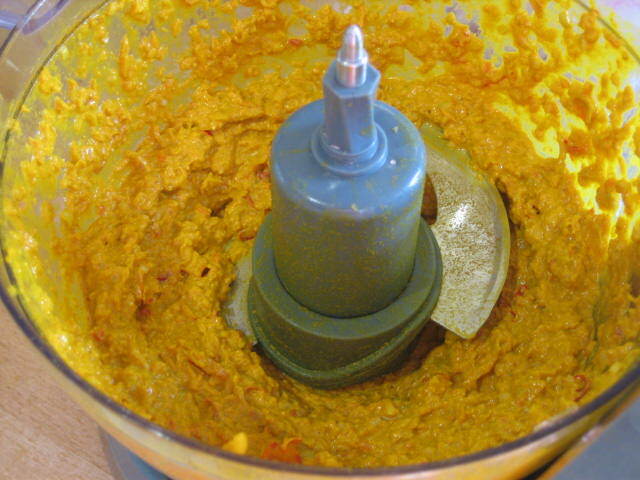 Blend and slowly add a couple of table spoons of nut oil until the paste is well blended and forms a paste. This may take a little bit of time and you will probably have to stop and use a spatula to push the sides of the paste down towards the blades. Once you have done this prep the other ingredients. 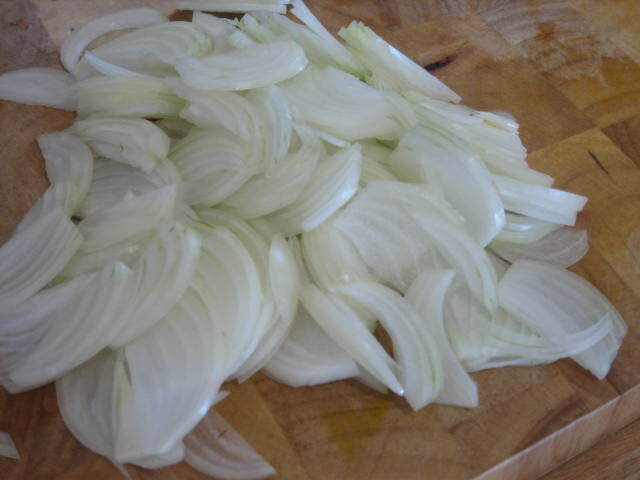 Finely slice the onions, cut the chicken into bite size pieces and season with salt and pepper. Take a large heavy based pan (like a Le Creuset) and add a couple of table spoons of nut oil. Add in all the curry paste and fry until fragrant (medium heat). 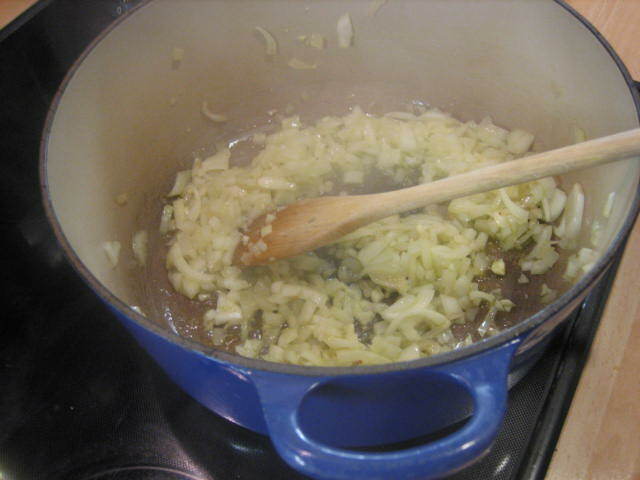 Add the onions and cook for 4 – 5 minutes until soft (do not brown). Add in the seasoned chicken and stir to coat in paste. Add all other ingredients apart from the green beans and the coriander leaves. Add the beans and cook for a further 5 mins or so until tender then you are done. Is that easy or what! Serve with rice. You could add lots of other veg too, it would be pretty nice with butternut squash, maybe some broccoli or some mange tout (snow peas). I am really looking forward to doing my own version with fish. YUM!!!! I must have cooked this curry a thousand times. 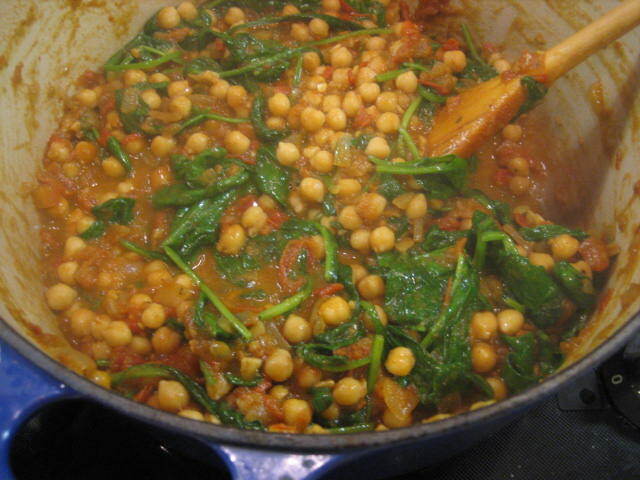 It’s fab – I suppose it is more like a stew than a curry as it is not very curry-y. It’s one of those “I don’t really have much time but I want something healthy and hearty for dinner” meals. This has been cooked for many of my friends as a last-minute meal and they loved it. 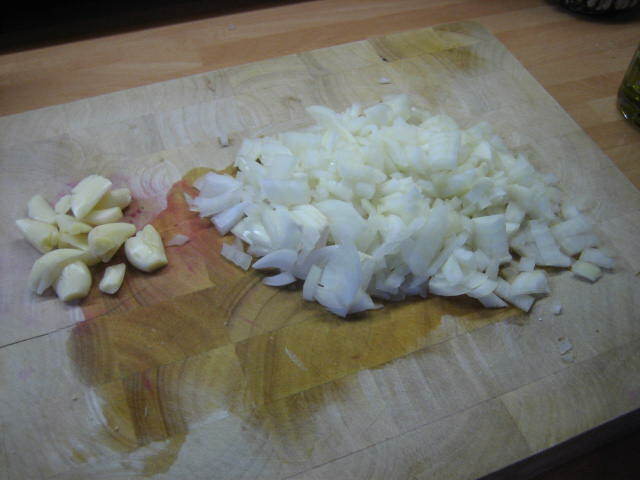 Finely dice onions and finely chop garlic. Add to heavy based pan with a hearty glug of olive oil and a large pinch of sea salt. Saute onions and garlic on a low/medium heat until soft and sweet. Add cumin and cook spice until fragrant making sure that the spice does not burn – this should only take a couple of minutes. Dice the tomatoes and add to the pot. 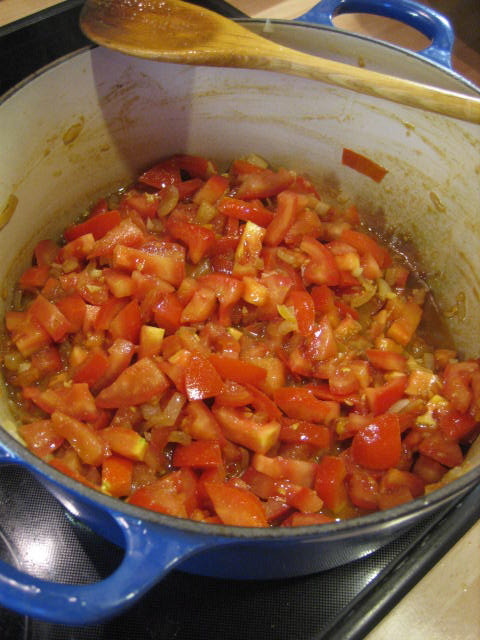 Simmer on a medium heat for 20 – 25 mins until tomatoes have fully broken down and has become “saucy” if you know what I mean. You may need to add a little bit of water if you feel that it is getting too thick. 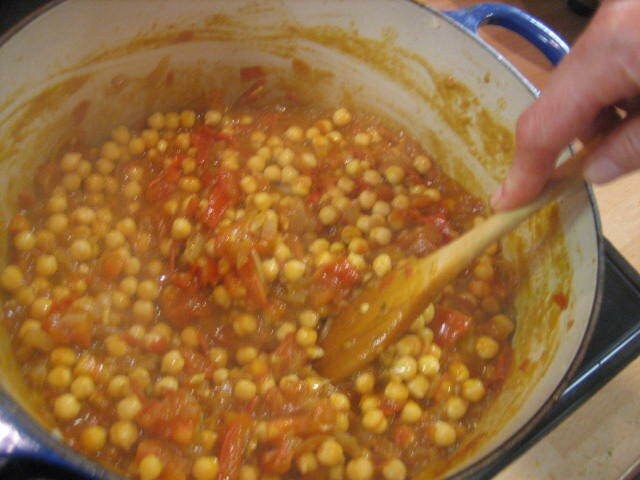 Add drained and rinsed chickpeas and simmer for a further 10 – 15 mins until chickpeas are nice and soft. The tinned ones tend to be a little bit firm. 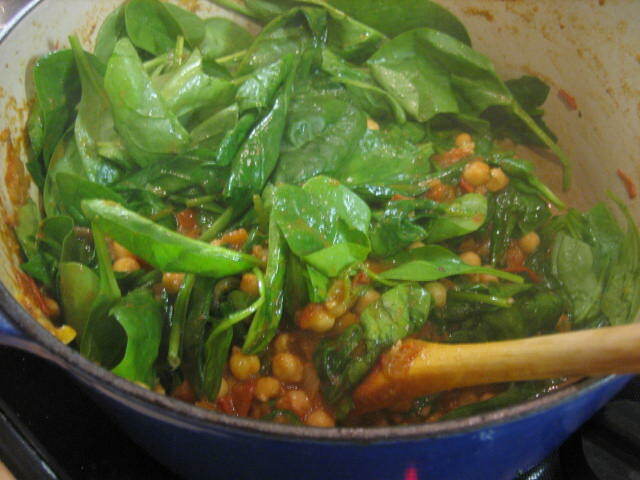 Add the baby spinach and stir through – season with salt and pepper to taste. N.B. You will need quite a bit of salt. Mix the yogurt with the tahini, you can add a little lemon juice and some seasoning if you wish but you don’t really need to. Serve chickpea curry with brown rice and tahini and yogurt sauce – I sometimes sprinkle the top with oven roasted unsalted cashews and a drizzle of peppery olive oil. 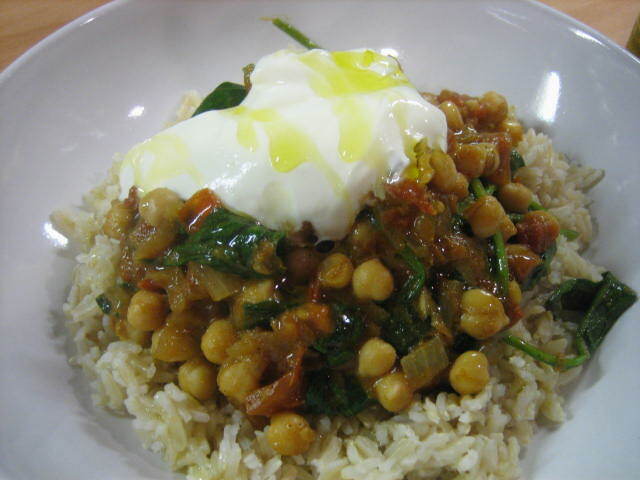 **** Please note the photo of the curry has plain yoghurt on it not the yoghurt and tahini sauce – I ran out of tahini. It’s really worth making though and just to let you know tahini is packed full of calcium and is really really good for you.